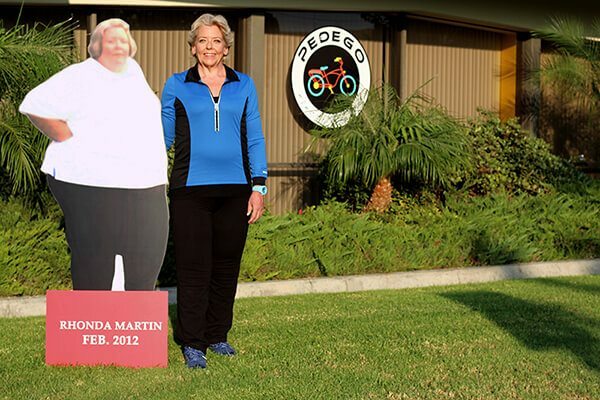 “How I Lost 163 lbs with My Pedego” – Pedego Owner, Rhonda M.
I first saw Pedego Electric Bikes when my husband, Chuck and I were working a booth at a “Green Expo” in October of 2009 in San Diego. I was very intrigued. I took one out for a test ride a couple of times. I kept riding it over to Chuck to check out it. He kept telling me to get out of there. He wasn’t interested at all. Finally, he agreed to take a test ride to get me to be quiet I think. Chuck instantly fell in love and we bought 2 Comfort Cruisers that same day. I loved the bike because it felt great to have a woman of my size to be able to move so free. We took the bikes out I think a total of two times. I crashed and burned both times. It was not a pretty sight. It had been almost 25 years since I had been on a bike and I had terrible balance. Chuck said no more! They sat in our garage gathering dust and me gaining more weight until February of 2012. I had decided that it was finally time to do something about all the weight I had gained. It took some convincing on my part but I was finally able to convince Chuck to give me another chance on the bike. When we first started riding, I could barely do a half mile at a time. 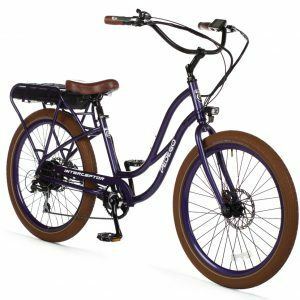 I would pedal for about a half mile and then use the battery for a mile or so. For the first month or so we would only “ride” about 6 miles at a time every Saturday and Sunday. We ended getting a trailer to tow behind so our dog Casper can go on most of the rides with us. Over the months, we would ride most weekends and I was able to work my way up to about 18-20 miles a day. I had made it a goal of mine that on November 1st, 2012, I would start commuting to work by bike part way and take public transportation the rest of the way to work and then by January 1st, 2013, I wanted to be able to commute the entire way. The Sunday before November 1st, Chuck and I decided to do a test run for my commute to work. We rode the bikes about 5 miles to the trolley station and when the trolley arrived, I decided it was too much of a hassle to get the bike on the trolley. There is a long hill that I was concerned about making my way up that was on the route to get to work. I didn’t think I was physically capable of pedaling up the hill. We decided to give it a go that day. What was the worst that could happen? Well, I made it up that hill and I was still breathing! I decided that day that I would just start doing the full commute starting November 1st. That first day, Chuck was concerned about me and so he waited at home for about half hour after I took off and then followed out on the route of my commute. He followed me all the way into work and all the way home at the end of the day. I survived that first day and now look forward to my rides to work every day that is possible. From my house to work is 14.4 miles. I ride to work every day weather permitting or when I have no other errands to run that day. Since the first of November, I have probably ridden about 1,400 miles between work and our weekend rides. The longest I have ridden is 35 miles. I swear all the people I see on my way to and from work think I am crazy. I am smiling and saying good morning and good afternoon to everyone along the way. (Even when it is freezing cold in the morning and I have 3 layers of clothes on.) I am truly happy when I am riding a bike. What better way to get exercise than by doing something you love. When I started back in February, I could barely handle walking. My husband had to most of the shopping. I would be almost worn out just by walking from the car in the parking lot to the store. I was not healthy at all and very overweight. In the course of the past year, I have lost 163 lbs, by making a few changes in my diet and riding my Pedego and loving every minute of it. I have found that I love to ride bicycles. 90% of my exercise is done on the seat of a Pedego. I still have a lot of weight to lose but I know I can achieve my goal, with the help of my Pedego. In the past year, Chuck and I have also purchased 4 more Pedegos. We traded in our Comfort Cruisers, for 2 Interceptors, and then Chuck traded in his Interceptor for the new City Commuter. I have since taken over the City Commuter and in the last month, he has bought the new Trail Tracker. 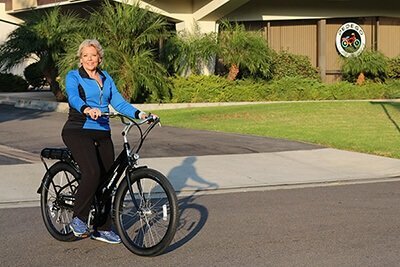 With our “fleet” of electric bikes, I am able to trade back and forth so I am not putting a lot of miles on just one bike. We love Pedego’s customer service. The best I have ever experienced. These bikes make me feel young and free and alive. If I had to pick just one word to describe it, it would be FUN! 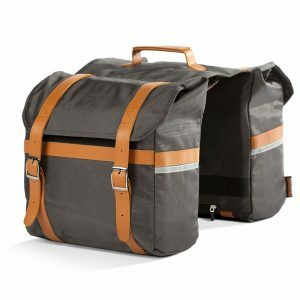 Thank you Pedego for helping me get my life back.